ATHENS – Former U.S. 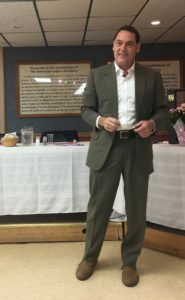 Congressman Zack Space didn’t go full Bulworth last week speaking to Athens County Democrats, but he did deliver one of the most candid assessments of the major threats facing American democracy I’ve seen in a public speech. The two biggest threats to democracy, Space said, are gerrymandered U.S. congressional districts and the undue influence of campaign donations and moneyed interests. He said that these things have combined to undermine citizens’ faith in the institutions and systems behind the American constitutional republic. “People have lost faith. They have lost faith in the Democratic Party. They have lost faith in the Republican Party. They have lost faith in politics. And they have lost faith in democracy in this country,” Space said. Space, from Dover in eastern Ohio, represented Ohio’s 18th U.S. Congressional District from 2007 to 2011. He said he is currently considering a run for state auditor in 2018. Space was defeated for re-election in the Tea Party Republican wave of 2010 by Bob Gibbs of Holmes County. He has since returned to his practice as an attorney. After the 2010 U.S. Census, Ohio lost two congressional district seats, rendering the 18th district obsolete. Gibbs’ district was reshaped and became what is now Ohio’s 7th U.S. Congressional District. Space encouraged those attending the Athens County Democratic Party spring dinner to question why so many fellow Americans, Ohioans and Appalachian Ohioans either don’t bother to participate at all in elections or vote for alternative candidates like President Donald Trump. Unless the system is fixed, Space warned, Americans will continue to see a lack of participation and more of a bend toward authoritarianism such as he said has been seen in the last few months. So what in the system is broken, and how can it be fixed? “There are two major issues that account for most of this dysfunction,” Space argued, first pointing to the politicized process for determining how U.S. congressional district lines are drawn after the U.S. Census every 10 years. Space noted the fact that in Ohio and across the nation, fewer and fewer congressional races are competitive. U.S. Congress regularly receives less than 20 percent approval in opinion polls, and yet has an average 96 percent reelection rate. Ohio has 16 congressional seats, four with incumbent Democrats and 12 with incumbent Republicans, and every one of those seats is safe, Space said. But the end result of allowing politicians to draw up their own seats is that none of them are politically vulnerable in a general election, he said. The only vulnerability they face is during primaries when challengers in both parties go further to the incumbent’s right or left, depending on party, he said. “So you’ve got this force that’s pushing everybody to the extremes, not leaving any room for compromise, for negotiation, or even civility,” he said, contending that this is responsible for much of the polarity, extremism and acrimony in American politics today. Fixing the redistricting process is possible, Space said, encouraging people to sign petitions that call for fair redistricting in Ohio and elsewhere. THE SECOND THING THAT’S broken the system, Space said, is how campaigns are financed. He recalled his own tenure in Congress, pointing to the time he and everyone else spent in the U.S. congressional “dialing for dollars” call centers. Known to some as “the bunker,” these are essentially phone banks for members of U.S. Congress where they sit with a list of potential donors, cold calling and asking for money for reelection efforts. Space said he spent over 40 hours working each week and another 30 to 40 hours fundraising. Finally, he said, it harms the legislative process itself. Space said that America needs to take the money out of the process with campaign finance reform and stop allowing legislators to draw their own districts. “If we fix the structural parts of our democracy that are broken, then we can start governing with tolerance and compromise and with understanding to rationally and objectively deal with the problems we face as a state and a nation,” he said.